The Atticus Kodiak series by Greg Rucka follows the adventures and (more importantly) transformation of a ex- U.S. Army soldier turned bodyguard. The first four books of the series are very well-done but fairly straight-forward thrillers.... 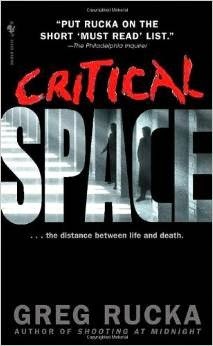 The fifth book in the series, Critical Space, marks a turning point in the series. While the first four books were essentially bodyguard-based crime novels, from here on the books become something more akin to international thrillers. While all the Kodiak books are worth reading, this one really stands out from an inspiration standpoint. Atticus Kodiak finds himself on an island in the Caribbean, where he spends months making learning to be one hell of a badass. The chapter in Critical Space detailing his regimen is one of the best of its kind I've ever read. It's sort of like a written version of a training montage from a movie. Essentially, Atticus spends his time strength training (with lots of pull-ups) and practicing martial arts. To aid in balance and recovery, he uses yoga and ballet. (Don't scoff at ballet; it's far more challenging and even dangerous than people realize.) He also goes on long ocean swims. As for diet, Atticus gives up alcohol and caffeine while eating lots of fresh fruit (especially watermelon) and seafood.... By the end of his training, Atticus Finch is essentially a new man. Critical Space is a great example of how a commitment to fitness and wellness can lead to something akin to a personal rebirth. While poking around on the Web, I found the text for the aforementioned montage. Here it is, in its entirety. Of course, from a training standpoint, I don't agree with everything Atticus does, but it's a cool sequence with some stuff worth thinking about. Please note that no copyright infringement is intended. By posting this excerpt, I hope to encourage more people to buy Greg Rucka's work. It is always about you and your body. It's how you see yourself, and as a result, how you see the rest of the world. The body dictates everything. It's where it all starts. What you can make it do. What you can make it endure. How quick you can be. How precise. How quiet, and strong, and flexible, and still. It is the one tool you always have at your disposal, no matter where you travel, the one weapon that can never be discovered going through customs, never be spotted by a watchful guard or an attentive police officer. It is at the heart of everything you do, and you must be able to trust it absolutely. You're up at sunrise, with at least eight and sometimes nine hours of sleep already at your back. The rest is as important as the exercise, and you should avail yourself of the luxury while you can; there will be times when you must go without sleep, when you are running or hunting, and when those times come you must be strong. Take the rest when you can. When the sunlight or – if it's raining – your internal clock wakes you, you shut off the alarms and check the perimeter to make certain nothing happened during the night, though you already know nothing did. This is vigilance, not paranoia; this is a constant awareness of your environment, and you must rely on it wherever you go. Getting lazy gets you killed. Secure though you may be now, there is always someone hunting the hunter. Certain that nothing requires your immediate attention, you move out to the veranda, or for variety, the patio, and begin your day. You start with yoga. Initially, you used the Hatha style, though over the years you have adapted it to something more suitable to your needs. The metaphysical and spiritual aspects of the tradition hold no interest for you; you are strictly interested in the practical. Yoga promotes flexibility, keeps your joints loose and strong, builds endurance and strength, teaches a control of your breathing. It requires self-awareness, and allows you to monitor your body for changes or injuries, for anything that could later develop into a problem. You are so practiced at this that you can easily support your entire body weight on a single appendage, on your foot or your hand or your head. Yoga can take up to an hour, and now it's time for breakfast, since you cannot train without nutrition. You throw fresh fruit into a blender, perhaps with some plain yogurt, though an egg once a week is not out of the question, and sometimes you have a muffin or some toast. Whatever you decide, once there is something in your stomach, you take the supplements. Silica, magnesium, B-vitamins, micronutrients, Siberian ginseng, lutein, taurine, carnetine, glutamine, creatine, chromium, all natural, all taken to keep you at your peak. Some of these you mix into your juice or the smoothie you make. Some of these come from pills. You don't supplement vitamin C or potassium simply because you're getting all you need from your fruit intake. If you're female, you supplement iron; if you're male, you take zinc. You avoid artificial chemicals, and you never take steroids or other engineered drugs. You cannot risk a dependence. Addiction will dull you, teach your body how to lie, and that cannot be permitted. You go downstairs, to the basement and the mirror. You begin at the barre bolted to the wall. First position through fifth, standing straight, then in demi-plie, then grand-plie. You do port de bras, a whole series of battements, extending and returning your arms and legs. After a time, you move onto the floor, watching yourself in the mirror, and you repeat the exercises, faster now, and assembling steps into what could charitably be called a dance. A grand temps lie, arabesques from different positions and angles, then the turns. These lessons in ballet, this practice, is as vital as any exercise with weights or guns, and thus you give it your total concentration and effort. Ballet develops a sense of rhythm and timing; it focuses breathing; it requires control. In ballet, every aspect of the body in motion is the body in control. Each inch of your body is trained to respond precisely to your will, with strength and speed. These are skills that serve you well. It's an easy transition to go from ajete en tournant on the floor into the padded post, turning your dance into an attack, working on your hand-to-hand skills and your footwork. This is shadow-boxing, fighting invisible enemies at full speed, with all of your power. You're not practicing any specific martial art, you've no interest in Kung Fu katas. What you use is a combat style, uniquely your own, a hodgepodge of maneuvers and moves acquired over the years or developed on your own, picked for speed, savagery, finesse, efficiency. You work freestyle, stringing moves together and often surprising yourself with new combinations, new ways to move from wrist to elbow to knee. You prefer the post to the heavy bag because you can move around the post, attacking from any angle, any direction, any height. You weave and duck across the floor, defending yourself against invisible assailants, then attacking again, holding nothing back. If it weren't so damn exhausting, it might be fun. When you're soaked with perspiration and your lungs are crackling with each breath, you redouble and push harder, because you've never yet been in a fight that ended merely because you wanted a breather. Often you practice with weapons, using a stick or a knife or both on the pole. Sometimes you wield a set of keys, or a box of wooden matches, or a plastic comb, or a drinking glass, or your shoe, or belt, or watch. You use anything you can think of, anything that might, one day, be at hand. All that matters is where it connects and how hard it hits when it does. You stop. You're out of breath, sore, thirsty as hell. It may work for those models in magazines, the ones whose muscles are so cut, who look sculpted from clay, but you know the truth behind it. You're actually stronger, in better form and shape and condition than any of those hard bodies, and if you went without water for three days before a photo shoot, your skin would be as thin as paper and your abs would look like that, too. But of course, then you'd be weak, sick, and dying. So you damn well stay hydrated. There's a roll of tape on the end of the barre, and you use it on your wrists before moving to the heavy bag, the one you filled with water, rather than sand, because water makes the bag feel more like a human being would feel. You throw punches, knees, elbows. You practice kicks, always low, because anything higher is too slow and renders you too vulnerable. You practice eye gouges and throat shots and organ hits, always visualizing the anatomy of your target, the solar plexus, the liver, the kidneys, even the frail projection of the xiphoid process, where one blow can send slivers of bone into the vital organs. You don't ever go for the face unless you want to send a message. Then to the speed bag, practicing tempo, rhythm, endurance. Then you jump rope, practicing your footwork, staying light and quick. When you finish, you've been at this for over three hours. You drink more water, and remind yourself that this was the easy part. You swim two miles in about forty-five minutes, and with the tide and the waves and the current, you're working out your whole body. The salt water keeps your skin healthy and strong, and you've noticed that cuts and scrapes heal faster as a result of your relationship with the ocean. Back on shore you stretch, drink water, then you pick up the two-by-four and start your run, holding it in front of you, always in an overhand grip, because carrying it on your shoulders or your back would be too easy. One day you'll have to run carrying something, maybe a rifle, maybe something more awkward and heavy. You begin along the beach, but there are paths all around the house, and you vary your route every day, never allowing your body to become too familiar with any one routine. At different points along your run, you stop. You grab a branch and do pull-ups or dips. You drop on your back and do sit-ups. Each exercise you do has been picked for its practicality, was long ago evaluated and added to the repertoire on the basis of, first and foremost, how well it trained you to move your own weight, and to move it quickly. You don't do crunches, for instance, because you're not interested in having a washboard upper abdomen; you do sit-ups simply to get to your feet as swiftly as possible, to allow you to perform a kippup, where you can go from flat on your back to your feet with one motion. You do pull-ups because you know one day you will need to lift yourself into cover, or over an obstacle. You don't do push-ups because you see no possible offensive or defensive use for that motion. Because you've done these exercises so much, done them so often, your body adapts quickly. That's too close to complacency for you, and so you've got to break it up, vary the routine. Instead of a two-mile swim, you push yourself sometimes to five, swimming the circumference of the lagoon and all the way out to the open sea. Once a week, you run the equivalent of a marathon, all the way around the island. It's not a very big island, and you can end up running its length multiple times. Three days a week you train with free weights, but you only work the major muscle groups, and this is to keep your body active in different ways. You're not looking to develop more muscle, only to stimulate what you've already got. Squats and squat thrusts and leg presses to keep the lower body active. Military and bench presses for the upper body and shoulders. Two days a week you take off to let your body recover. This means you do yoga in the morning, and then a light swim, only a mile. You alternate the days, to keep your body fresh, but you never skip two in a row. Twice a week, unless there is a need to do otherwise, you work with the firearms. Wearing eye and ear protection in the basement, you fire two hundred rounds through different pistols, different calibers, just keeping in practice. You work with your off hand, you train standing, kneeling, prone, even on your back. You use the shotgun and the submachine gun and the rifle, just to maintain familiarity. Then you clean all the weapons, making certain they work as they were designed to, that they will be ready when you call upon them. You pick your food carefully. Lean meat, fish, lots of fruit, lots of vegetables. You are partial to watermelon, not only because it has such a high water content, but also because it is an exceptionally nutritious fruit. You drink water constantly, juice occasionally, green tea rarely. You avoid caffeine. It is the worst possible natural stimulant, addictive and draining to the adrenal gland. Since you have almost no fat on your body, you include it in your diet because you need that fuel, and don't want to burn the sugar out of your muscles. Nuts are good, and olive oil. It's hard to get dairy, but whole milk is acceptable. Your taste for artificial sweets, desserts, is limited – fruit is much more appealing. The first week is hell, you know you're going to die. It doesn't matter if you've trained for the Olympics or gone through Basic or reached your umpteenth-level black belt in Tae Kwon Do, your body has never been asked to work like this, to adapt and change to so much so fast. It rebels, sending out every signal it knows in an attempt to get your attention, begging you to quit. When you run, you get sick to your stomach. Your shins feel knotted, your legs are in chaos, the ballet training giving pain everywhere, from the arches of your feet to your calves and knees and hips. When you carry the two-by-four, you see a muscle in your forearms pop up beneath the skin like a golf ball. Your shoulders, arms, chest, and back ache. There are times when you cannot stand up, and each time you try, your thighs cut out on you again, your quadriceps utterly useless, and you find yourself falling to your knees and powerless to resist gravity. The first time it happens, it's alarming. The sixth time, it's pathetically funny. Muscles don't hurt; they burn, and by the second day, all of them have come together in one bonfire that rages all along your body. To combat the agony, you receive regular rubdowns, to drive the lactic acid from your calves and thighs and back, and that hurts, too. Every night before falling into the exhausted stupor that is substituting for sleep, you use a liniment that smells at once of camphor and molasses – dit da jow it's called, and if you could fill a tub with the stuff and soak in it, you would. It stains your skin amber, but you don't care – it works, seeping into your muscles while you sleep, soothing the pain. But when you wake the next morning, that little gift is gone. You're stiff and sore and the act of getting out of bed makes you want to weep. You're constantly hungry, too, because fruits and vegetables and a little sliver of fish, that's not food, it's not enough. You think you drink water just to have something in your gut. Because of all the supplements, your urine has turned neon yellow. The burning in your muscles continues, and you live on faith that, if you stick with it for long enough, it will pass. But you're seeing no signs that it will. The second week is a study in disaster. You think you've pinched the sciatic nerve, but learn that, instead, the iliopsoas – the muscles that work your thighs at the hips and secure the pelvic girdle – have seized up as a result of all of the ballet training. The constant spasm is pulling your back and legs out of whack, and the pain shoots down your hamstrings as if on razor-wire. On day ten, while shadow-boxing at full speed and full power, something spasms and for a time you can't turn your neck. Then the muscle relaxes, and you can move your head again, though now it feels like someone is resting their whole weight on their knees, and their knees are somehow on your shoulders. That soreness remains for the next several days. The general muscle burn continues, but now it is endurable. The rubdowns at the end of each day are so essential that you shave your legs to avoid the constant hair-pulling. And while one burn may be preparing to leave you, another has arrived, a sunburn so bad that blisters have risen on your back and shoulders, the result of constant exposure to the sun. Sunblock has proven worthless, it simply sweats right off your skin, even the brands advertised as waterproof. Maybe it would be different if you were just taking a quick dip and then drying off on your towel, but because you're running after the swim, because it feels as if you are constantly in motion, you'll never really know. Day twelve, while running the trails, your ankle twists and you take a header into the ground, ramming the two-by-four into your chest. The bruises appear within hours, your skin rising taut with the edema, and you learn that the best way to deal with the injury is by massaging the swelling out, getting the fluid and blood to dissipate. It hurts a lot. You end up soaking your sprained ankle in a bowl of dit da jow. You are so hungry you think that maybe you dreamt of a cheeseburger last night. The third week you start to turn the corner. The pain in your muscles is less constant, though you're still relying on those rubdowns to keep your body from seizing up like a rusted engine, and you stink constantly of camphor and molasses. The ten-mile run that left you puking two weeks earlier is now negotiable, though certainly not easy, and that two-by-four is still the bane of your existence. All the same, you're surprised by the strength in your grip, the power in your fingers. You have opportunity to marvel at how swiftly your body adapts, and there are moments when your focus broadens, when you can see past the constant work to slivers of the results – you smell the ocean and it is different, cleaner, sharper. The trees have their own odors. Colors are sometimes shockingly vivid. Your skin has cleared up with the exercise and constant exposure to sunlight and salt water, and it feels different on you, tighter and stronger. You're growing to rely on yoga the way you once relied on coffee. You've learned enough that you try that headstand you've been seeing, and it's going well until you lose your balance completely and nearly kill yourself by going over the veranda. Your neck, recovered from the week prior, spasms again. The one part of you that seems to have endured thus far without complaint, your wrists, begin aching. You realize you haven't been taping them well enough before working the post and bags. Or maybe you're not punching right, and suddenly you're reexamining the mechanics of the movement, trying to work out what it is you're doing wrong. On the off days you download video, PBS's Dance in America, footage of the New York City Ballet, the Bolshoi. Dances choreographed by Balanchine, performances by Baryshnikov and Nureyev. An art that never held much appeal before now is fascinating, and you can break down patterns and steps, attempt to recreate what you see. You stink at it, and you know that, but that's not the point. You're beginning to understand the motion. The food tastes better, though your diet has remained fundamentally the same. Watermelon is astonishingly more delicious than tiramisu. For the first time you're not ravenously hungry. The fourth week, stepping from the shower and reaching for the towel, you see yourself in the mirror, and for a moment honestly do not recognize yourself. You stare for quite a while, wondering. By the eighth week, when you move, swimming in the water or running on the beach or working at the barre, you are completely aware of yourself, the space you consume in your environment and how to travel through it. You see for the first time, perfectly, the nearly infinite ways you can move your body, and with that comes an epiphany: you understand why yoga and ballet have survived for as long as they have. It is no longer just enough to do the exercises; now you strive for proper form and grace. You understand the beauty and benefits of being able to move your own weight, with mastery, completely. When you hit the heavy bag with your hips driving the blow and not just your arms, you're both delighted and horrified with the understanding of just what that blow would do to another body. Then one morning you rise with the sun and you look out at the water as you start your morning yoga and you realize you are up first, you are folding yourself out of your handstand before she even emerges from her bedroom. You greet one another, say good morning. You settle into the day. You realize you have been doing this for almost four months. And you know it's got to end soon, one way or another.